Includes lid for storage or use on the go! Life with kids means an abundance of stuff, so let’s free up space in those overstuffed cabinets and diaper bags. Our premium, non-toxic, silicone Go Bowl™ springs into action for snack time fun and quick dining, at home or on the go. 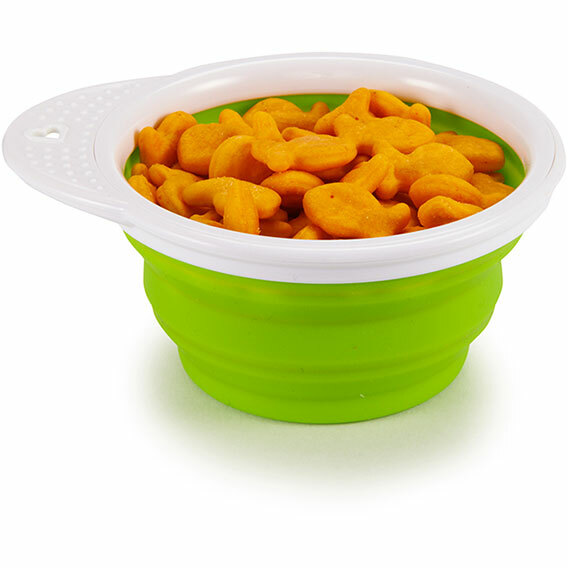 This mealtime multitasker effortlessly expands from a flat, half-inch disc into a handheld bowl and includes tight-fitting lid for storage or use on the go. After a visit to the dishwasher, it collapses back down to fit easily into any crowded drawer, cabinet, or lunch tote. Kids and parents love the pop-up action – it’s almost as addictive as bubble wrap! Safe materials and simple storage make this collapsible bowl a true winner. We know you’re bowled over, too.